Now I'm not really one for heights but if you can manage the startlingly fast lift journey up to goodness knows how many floors of the Sky Garden building, it will most definitely be worth the slight dizziness (I'm probs just a bit of a wimp, SOZ). 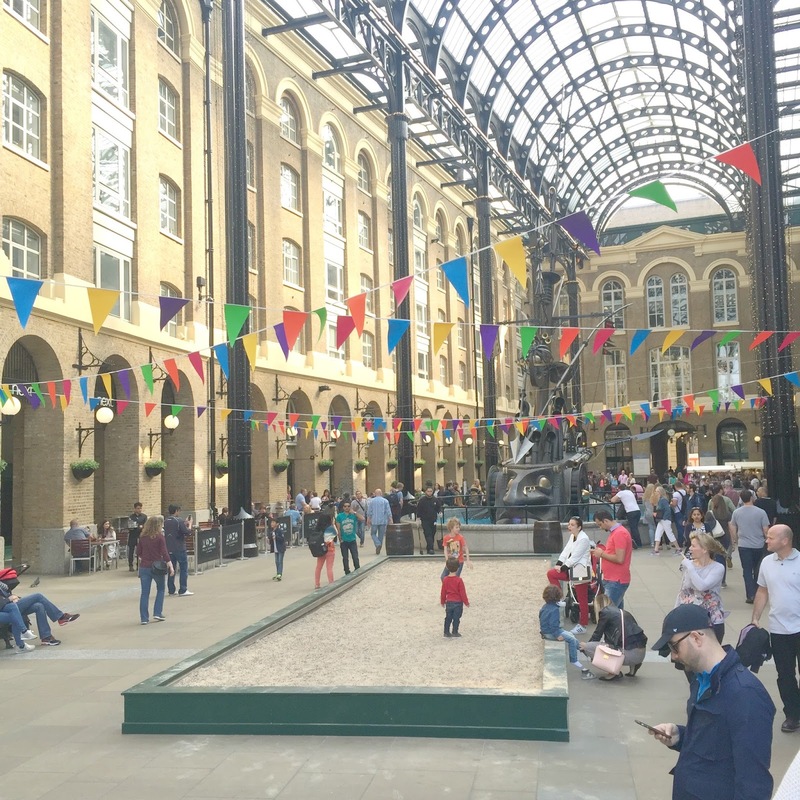 Unlike most things in London, this is totally, 100% FREE; yes you heard me correctly! You can enjoy stunning views across London and with a gorgeous (albeit slightly overpriced) bar and have drinks with friends or family; the perfect way to spend an hour or so on a summers day. 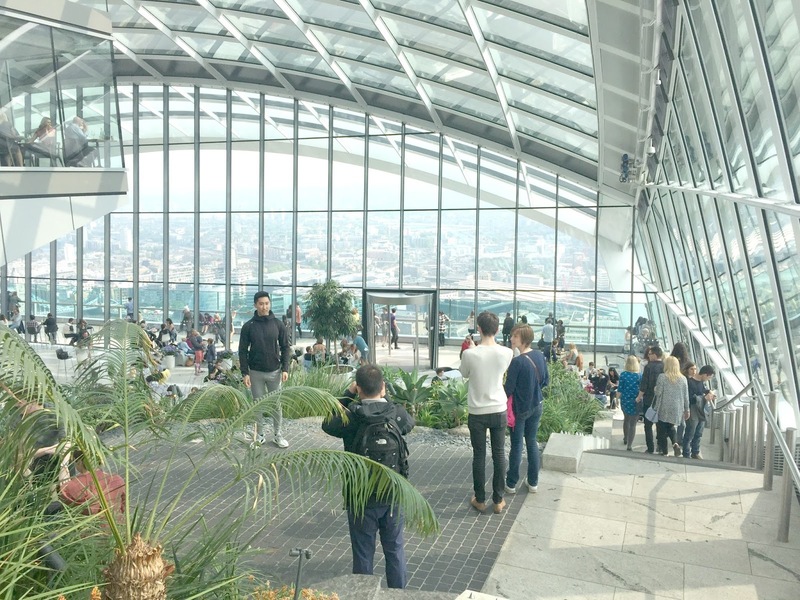 As well as the views, the plants and whole layout of the garden are beautiful and with the floor to ceiling glass, it makes for the prettiest and brightest way to look over the city. I've never been too attracted to the idea of the London Eye because of being stuck in the little pod so high up with no way to get off (anxiety problems) but with the Sky Garden you can look over London as little or as much as you like whilst enjoying your drinks and the gorgeous interiors and ovbs you're free to go down as quickly as you like! This was such a fun way to start our weekend and definitely something I'd recommend if you want to be a little tourist-y! After seeing all my fave bloggers and instagrammers posting photos of the most gorgeous peonies wrapped in brown parcel paper and pretty much every other flower, cacti or succulent imaginable I knew I needed to make a visit to Columbia Road. 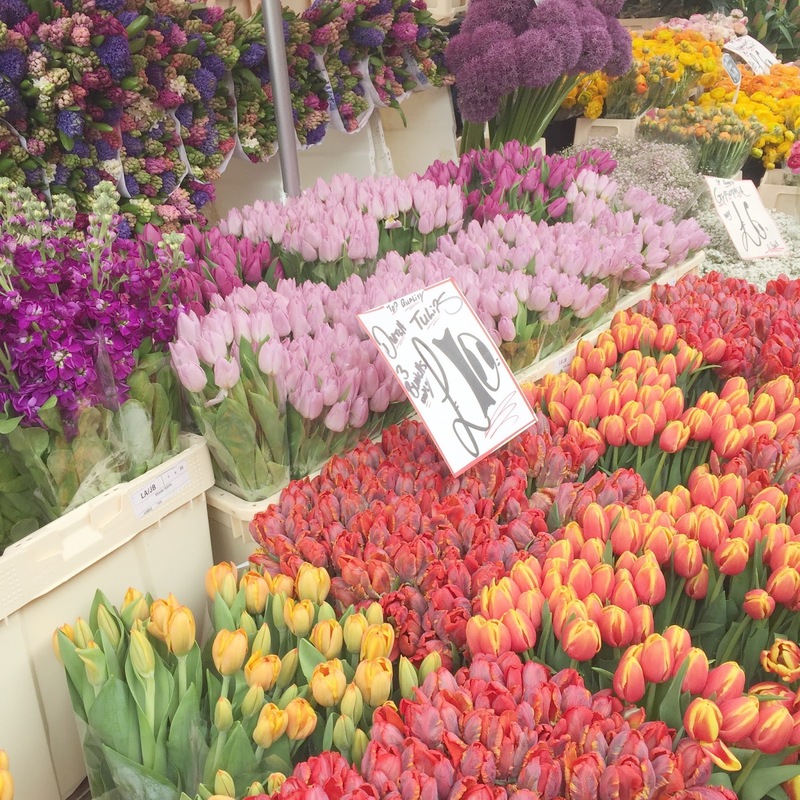 Even if you're not into flowers or have any intention of buying any, I would 10000% recommend taking a walk down the street which is absolutely jam packed with flower stalls and crowded with people, music and all round positive and happy vibes. Crowded would be an understatement when it comes to Columbia Road but it was definitely worth shuffling through the crowds to admire the beautiful flowers; it's just down right amazing how many people come out each Sunday to get their flower fix. We were lucky to visit on a super sunny Sunday and it was such a lovely morning! There are also an abundance of gorgeous pastel doors and houses in and around the market FYI. Perfect for Insta ;) Also another free place to visit! Obvs when I was in London we did the typical Oxford Street browsing but taking a 5 min detour down past Liberty to Carnaby Street is definitely a 'must do' for shops that are a little quirkier and to take a stereotypical photo of the Carnaby Street sign and pastel shops! Being only just off Oxford St means it's still busy and bustling but the vibe is a little edgier and with so many delicious food places (Kingly Court is a MUST for the best froyo ever!) to visit, you really could spend hours on Carnaby Street and exploring Soho! I have lots of memories of running around this area during fashion week interning picking up the weirdest things and with very aching feet so it's always nice to reminisce about how fun but odd that whole experience was! BEING A TOURIST-BECAUSE WHY NOT? Something you definitely won't be able to come to London without doing is eating a tonne of delicious food and that's TOTALLY okay because of all the walking around you'll be doing. Not that eating yumminess needs a justification anyway! Stalking Instagram and making notes on your phone of restaurants and breakfast joints you are wanting to visit is definitely a bonus for when in London because it can be overwhelming with the amount of eateries and not wanting to miss the best places! 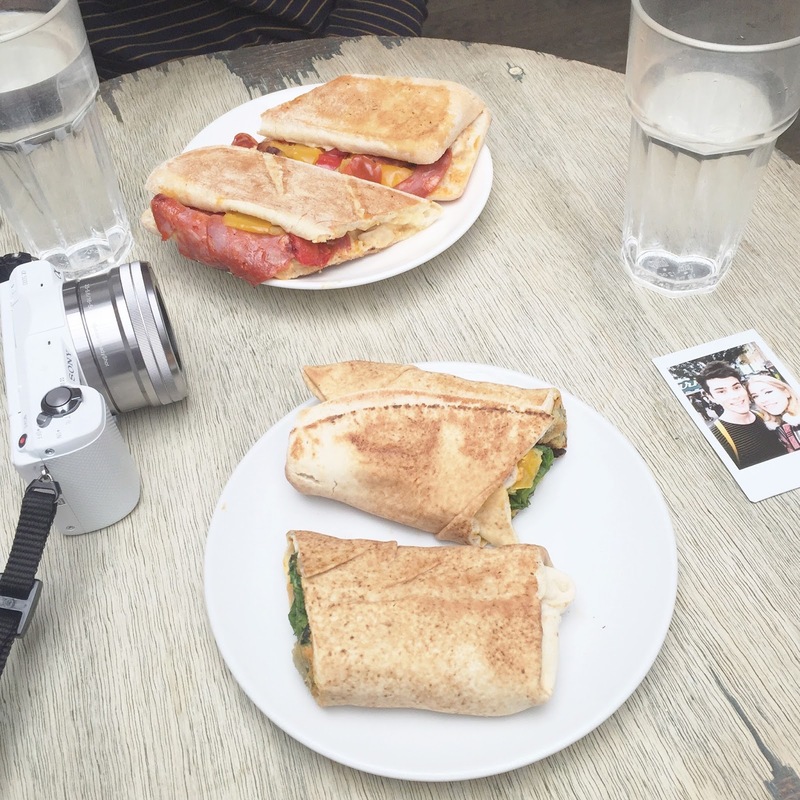 The two fave places that we visited include Yumchaa (tonnes around London serving yummy loose leaf tea and the BEST falafel), Benugo for v yummy lemonade and muffins! Also on my list that I desperately want to visit another time and might be helpful if you're looking for food destinations include Tanya's cafe (raw/vegan deliciousness), The Good Life Eatery, Rossopomodoro, Tibits (vegetarian buffet, YES PLS) and Eggbreak! Let me know if you have a London trip planned any time soon or if you're a Londoner yourself and have any other recommendations of things to see and do this year! I'd love to know!